One of the questions that everyone wants the answer to when looking at matches, regardless of what kind of DNA testing we’re talking about, is “how long ago?” How long ago did I share a common ancestor with my match? Seems like a pretty simple question doesn’t it? The answer, especially with mitochondrial DNA is not terribly straightforward. A perfect example of this fell into my lap this week, and I’m sharing it with you. There are three regions that are tested in mitochondrial DNA testing for genealogy. The HVR1 and HVR2 regions are tested at most testing companies, and at Family Tree DNA, the rest of the mitochondria, called the coding region, is tested as well with the mega or full mitochondrial sequence test. This is the mitochondrial equivalent of Paul Harvey’s “the rest of the story,” and of course we all know that the real story is always in “the rest of the story” or he wouldn’t be telling us about it! Many times, the rest of the story is critically important. In mitochondrial DNA, it’s the only way to obtain your full haplogroup designation. If you don’t want to just be haplogroup J or A or H, you can test the coding region by taking the full sequence test and find out that you’re J1c2 or A2 or H21, and discover the story that goes with that haplogroup. Guaranteed, it’s a lot more specific than the one that goes with simple J, A or H. Often it’s the difference between where your ancestor was 2000 years ago and 20,000 years ago – and they probably covered a lot of territory in 18,000 years! Let’s take a quick look at mitochondrial DNA. To begin with, the HVR1 and HVR2 regions are called HVR for a reason – it’s short for hypervariable. And of course, that means they vary, or mutate, a lot more rapidly, as compared to the coding region of the mitochondrial DNA. In layman’s terms, think of a clock. No, not a digital clock, an old-fashioned alarm clock. The entire mitochondrial DNA has 16,569 locations. The HVR1 and HVR2 regions take up the space on the clock face from 5 till until 5 after the hour. The rest is the coding region – the mitochondrial “rest of the story.” The coding region mutates much slower than the two HVR regions. Just to be sure we’re on the same page, let’s talk for just a minute about how mitochondrial haplogroup assignments work. For a detailed discussion of haplogroup assignments and how they are done, see Bill Hurst’s discussion here. Generally a base haplogroup can be reasonably assigned by HVR1 region testing, but not always. Sometimes they change with full sequence testing – so what you think you know may not be the end result. My full haplogroup is J1c2f. My base haplogroup is J. I’m on the first branch of J, J1. On branch J1, I’m on the third stick, c, J1c. On the third stick J1c, I’m on the second twig, J1c2. On the second twig, J1c2, I’m leaf f, or J1c2f. Each of these branches of haplogroup J is determined by a specific mutation that happened long ago and was then passed to all of that person’s offspring, between them and me today. The question is always, how long ago? Mutation Rates – How Long Ago is Long Ago? While we have a tip calculator at Family Tree DNA for Y-line DNA to predict how long ago 2 Y-line matches shared a most recent common ancestor, we don’t have anything similar for mitochondrial DNA, partly because of the great variation in the mutation rates for the various regions of mitochondrial DNA. Family Tree DNA does provide guidelines for the HVR1 region, but they are so broad as to be relatively useless genealogically. For example, at the 50th percentile, you are likely to have a common ancestor with someone whom you match exactly on the HVR1 mutations in 52 generations, or about 1300 years ago, in the year 713. Wait, I know just who that is in my family tree! These estimates do not take into account the HVR2 or coding regions. I did some research jointly with another researcher not long ago attempting to determine the mutation rate for those regions, and we found estimates that ranged from 500 years to several thousand years per mutation occurrence and it wasn’t always clear in the publications whether they were referring to the entire mitochondria or just certain portions. And then there are those pesky hot-spots that for some reason mutate a whole lot faster than other locations. We’re not even going there. Suffice it to say there is a wide divergence in opinion among academics, so we probably won’t be seeing any type of mito-tip calculator anytime soon. Family Tree DNA does their best to make our matches useful to us and to eliminate matches that we know aren’t genealogically relevant. For example, this week, I was working on a client’s DNA Report. Let’s call him Joe. Joe is haplogroup J1c2. I am haplogroup J1c2f. J1c2f has one additional haplogroup defining mutation, in the coding region, that J1c2 does not have. Joe and I did not show as matches at Family Tree DNA, even though our HVR1 and HVR2 regions are exact matches. Now, for a minute, that gave me a bit of a start. In fact, I didn’t even realize that we were exact matches until I was working with his results at MitoSearch and recognized my own User ID. I had to think for a minute about why we would not be considered matches at Family Tree DNA, and I was just about ready to submit a bug report, when I realized the answer was my extended haplogroup. This, by the way, is the picture-perfect example of why you need full sequence testing. Family Tree DNA knows that we both tested at the full sequence level. They know that with a different haplogroup, we don’t share a common ancestor in hundreds to thousands of years, so it doesn’t matter if we match exactly on the HVR1 and HVR2 levels, we DON’T match on a haplogroup defining mutation, which, in this case, happens to be in the coding region, found only with full sequence testing. Even if we have only one mismatch at the full sequence level, if it’s a haplogroup defining marker, we are not considered matches. Said a different way, if our only difference was location 9055 and 9055 was NOT a haplogroup defining mutation, we would have been considered a match on all three levels – exact matches at the HVR1 and HVR2 levels and a 1 mutation difference at the full sequence level. So how a mutation is identified, whether it’s haplogroup defining or not, is critical. In our case, I carry a mutation at marker 9055 in the coding region that defines haplogroup J1c2f. Joe doesn’t have this mutation, so he is not J1c2f, just J1c2. So we don’t match. So – How Long Ago for Me and Joe? Dr. Behar in his “Copernican Reassessment of the Mitochondrial DNA Tree,” which has become the virtual Bible of mtDNA, estimates that the J1c2f haplogroup defining mutation at location 9055 occurred about 2000 years ago, plus or minus another 3000 years, which means my ancestor who had that mutation could have lived as long ago as 5000 years. The mutations that define haplogroup J1c2 occurred about 9800 years ago, plus or minus another 2000. So we know that Joe and I share a common ancestor about 7,800 – 11,800 years ago and our lines diverged sometime between then and 2,000 – 5,000 years ago. So, in round numbers our common ancestor lived between 2,000 and 9,800 years ago. Not much chance of identifying that person! The ability to eliminate “near-misses” where the HVR1+HVR2 matches but the people aren’t in the same haplogroup, which is extremely common in haplogroup H, is actually a very useful feature that Family Tree DNA nicknamed SmartMatching. With over 1000 matches at the HVR1 level, more than 200 at the HVR1+HVR2 level and another 50+ at the full sequence level, Joe certainly didn’t need to have any “misleading” matches included that could have been eliminating by a logic process. So while Joe and I match, technically, if you only look at the HVR1 and HVR2 levels, we don’t really match, and that’s not evident at MitoSearch or at Ancestry or anyplace else that does not take into consideration both full sequence AND haplogroup defining mutations. Family Tree DNA is the only company that does this. Ancestry does not test at the full sequence level, so you can’t even get a full haplogroup assignment there, which is another reason, aside from inaccurate matches, that Ancestry customers often retest at Family Tree DNA. It’s interesting to think about the fact that 2 people can match exactly at the HVR1+HVR2 levels, but the distance of the relationship can be vastly different. I also match my mother on the HVR1+HVR2 levels, exactly, and our common ancestor is her. 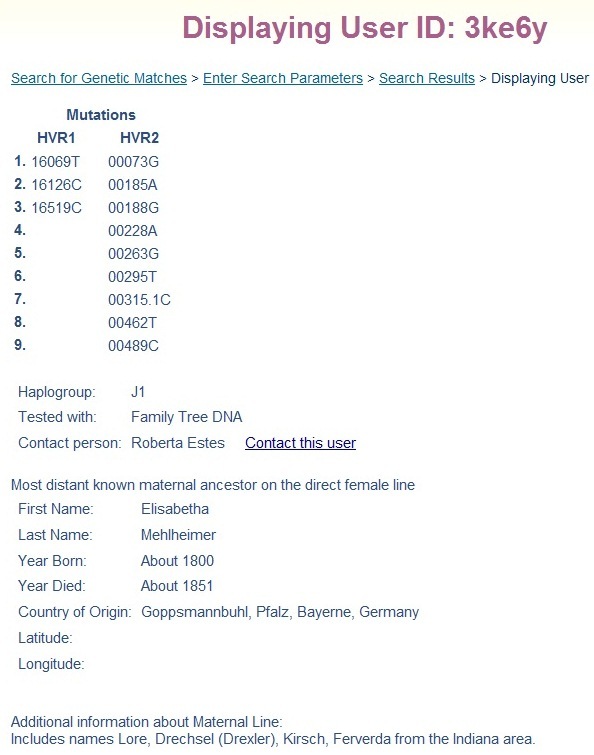 So the distance to a common ancestor with an exact HVR1+HVR2 match can be anyplace from one generation (Mom) to thousands of years (Joe), and there is no way to tell the difference without full sequence testing and in this case, SmartMatching. The reasons vary, and not everyone wants to prove their heritage in order to qualify for some type of assistance. Some want to find their tribe and join to reclaim their lost heritage. Some want to honor their persecuted and hidden ancestors, undoing some of the wickedness of the past, and some simply seek the truth. Regardless of why, they are all searching for information lost to them. I’d like to talk about three topics in proving Native Ancestry. First, I’d like to do some myth-busting. Second, I’d like to talk a little about conventional research and third, I’d like to discuss what DNA can, and can’t, do for you. As you read this blog, please click on the links. I’m not going to repeat something I’ve already covered elsewhere. There is no free college for Native Americans. There are sometimes scholarships and grants available, mostly by the individual tribes themselves, for their official members. Many people think that if they can only figure out which tribe their ancestor descends from, they can join. This is untrue. Each tribe is a sovereign nation, and they get to determine their criteria for membership. Most tribes require a specific percentage of Native “blood,” called blood quantum, in addition to being able to document which tribal member you descend from. Some tribes require as much as 25% Native heritage, and most require at least 1/16th Native heritage, which is one great-great grandparent. If you don’t know who in your family was a tribal member it’s unlikely that you would be able to meet the blood quantum requirement. Generally, DNA testing does not provide us with the information needed to determine a tribe, although it can clearly tell, using y-line or mitochondrial DNA testing, whether your direct paternal or maternal line was or was not Native. Sometimes you will be able to infer a tribe based on your matches and their documented history, but the definition of tribes, their names and locations have changed over time. We are working on improving this ability, but the science simply isn’t there yet and the number of Native people who have tested remains small. Simply put, most federally recognized tribes aren’t interested in more tribal members. More members mean a smaller piece of the pie for existing members. The pot of resources, whatever resources you’re discussing, is only so large and it must be shared by all tribal members. Tribes in the US fall into two categories. When most people think about tribes they are talking about federally recognized tribes. Those are tribes that have some continuity with the past, such as they have always been a tribe, or they still retain tribal lands, etc., and the federal government recognizes them as such. These are the tribes that qualify for government programs and many own casinos. As you might imagine, with the influx of casino money, the desire to join a tribe has increased significantly. The second category is non-federally recognized tribes. Some are state recognized and others, not at all. State recognition does not in any way guarantee federal or state funding and there are no universal standards for state recognition. In other words, your mileage may vary, widely. Non-federally recognized tribes are often run as non-profit entities. In many cases, these tribes will help people research and document their genealogy and may be more open to tribal membership for those connecting with their Native heritage. Be aware that some “tribes” that fall into the non-federally recognized category may be less than ethical. Some tend to come and go. In one case, to apply to join, one had to provide information such as social security numbers and a complete family pedigree including your children. In some cases, membership is very expensive, hundreds of dollars, but is available to almost anyone for the right price. When evaluating tribes that are not federally recognized, if something sounds fishy, it probably is. Caution is the watchword. In general, the federally recognized tribes do not feel kindly towards the non-federally recognized tribes and view them as “fake,” interlopers trying to get part of that pie. Of course, the non-federally recognized tribes feel differently; that they are reclaiming their heritage denied them. Native American politics is nothing new and is fraught with landmines. No federally recognized tribes, to the best of my knowledge, have considered DNA testing as a criteria for membership. No federally recognized tribe has endorsed or participated in DNA testing that I’m aware of. This does not mean that individuals have not privately tested. Given the criteria for membership in federally recognized tribes, traditional genealogy is the only way to obtain the type of information required. If your family history includes a tribal name, and east of the Mississippi, that most often is Cherokee, contact the various Cherokee tribes to inquire about membership criteria. If the membership criteria is 25% blood quantum, and you must live on the reservation, you’re toast…..no need to continue that line of research if your goal is to join the tribe. If your goal is simply to find your Native ancestor, that’s another matter entirely. Begin by using the traditional research tools. First, look at where your ancestor or that family line was located. Did they migrate from elsewhere? How were they listed in the census? Was someone listed as other than white, indicating mixed race? Check the records where they lived, tax records and others to see if there is any indication of non-European heritage. Remember that your non-white ancestor would have retained their “darker” countenance for at least 2 generations after being admixed. Many Native people were admixed very early. So first, check the normal genealogy records and look for hints and traces of non-European ancestry. Second, turn to Native resources that might reflect the Native people in the areas where your family is or was found. The Access Genealogy site is absolutely wonderful and has an amazingly complete set of records including searchable tribal rolls. In addition, I add information almost daily to the Native Heritage Project at www.nativeheritageproject.com, which is searchable. There are many more resources including several collections at Ancestry.com. Hopefully, these records will help narrow your focus in your family tree to a particular person or two, not just a general branch. Family rumors like “Grandma was a Cherokee Princess” are particularly unuseful. What they more likely mean is that there was indeed some Native ancestry someplace in her line. Cherokee has become a generic word like Kleenex. It may also have meant that Indian heritage was claimed to cover much less desirable African heritage. Institutionalized discrimination existed against any people of color in pre-1967 America, but Indians generally retained some rights that people of African ancestry did not. Laws varied by state and time. Take a look at my blog about Anti-Miscegenation Laws and when they were overturned. Now, let’s look at DNA testing to see what it can do for you. There are three types of DNA testing that you can do to prove Native Ancestry. Two are very focused on specific family lines, and one is much more general. Mitochondrial for your direct maternal line. Y-line for your direct paternal line – if you are a male. Sorry ladies. Autosomal to test your ethnic mix and one direct marker test for Native ancestors. You can see the path that the blue Y chromosome takes down the paternal line to the brother and the path the red mitochondrial DNA takes down the maternal line to both the brother and the sister. Autosomal tests the DNA of all of the 16 ancestral lines shown here, but in a different sort of way. Let’s look at each type of testing separately. The Y-line testing tests the Y chromosome which is passed intact from father to son with no DNA from the mother. This is the blue square on the pedigree chart. In this way, it remains the same in each generation, allowing us to compare it to others with a similar surname to see if we are from the same “Smith” family, for example, or to others with different surnames, in the case of adoption or Native heritage. Native American genetics isn’t terribly different than adoptees in this situation, because different English surnames were adopted by various family members, into the late 1800s and sometimes into the early 1900s, depending on the location. Y-line DNA can tell you whether or not you descend from a common male genealogically when compared to another testing participant. Small mutations do take place and accumulate over time, and we depend on those so that we don’t all “look alike” genetically. It can also tell you by identifying your deep ancestral clan, called a haplogroup, whether or not you descend from early Native Americans who were here before contact with Europeans. For that matter, it can also tell you if you descend from those of African, European or Asian ancestry. Scientists know today that there are only two primary haplogroups indicating deep ancestry that are found among Native American males who were here prior to contact with Indo-Europeans, and those haplogroups are C and Q3. It is not accurate to say that all C and Q3 individuals exist only in the American Native population, but the American Native population is part of the larger group worldwide that comprises C and Q3. We find some haplogroup C and Q3 in Europe but none in African populations, although we do learn more every single day in this infant science. The Cherokee (or those tribes who were assimilated into the Cherokee) adopted a European male into the tribe or a European male fathered a child that was subsequently raised as Cherokee. The R1b ancestor was not adopted into the tribe, maintained their European/American identity but married a Cherokee individual woman and their descendants are recognized as Cherokee today. There is some level of R1b admixture in the Native population that preceded contact with Europeans that we have not yet identified. Because of the unique haplogroups for Native Americans who preceded European contact, Y-line is the only way to positively confirm that a specific line is or is not of Native American descent. This obviously applies to all of the individuals in the pedigree chart who directly descend from the oldest known ancestor in this paternal line. Y-line testing does not indicate anything about the contributions of the other ancestors in this family tree. In other words, you could be 3/4th Native, with only the direct paternal line being European, and this test would tell you nothing at all about those other three Native lines. When ordering DNA tests at Family Tree DNA, which is where I recommend that you test, everyone is encouraged to join projects. There are several types of projects, but to begin with, you should join your surname project. Not only does this group you with others whom you are likely to match, but this also assures that you receive the project based discounts. I blogged about how to find and join relevant projects. You can test at 12, 25, 37, 67 or 111 marker “locations” on the Y chromosome. I generally recommend 37 or 67 to begin which gives you enough to work with but isn’t terribly expensive. At Family Tree DNA, you can always upgrade later, but it’s less expensive in total to test more initially. Right now, 37 markers cost $119 and 67 markers are $199, but a sale is currently underway. After your results are returned, you can then upload or manually enter your results at www.ysearch.org (upload directly from your Family Tree DNA matches page), www.smgf.org and www.ancestry.com. You can then check for matches at these sites as well. Not all of these other sites test as many markers as Family Tree DNA, but the comparison is free and useful. Even if your haplogroup is not Native American, you may match others with a similar heritage story for their paternal line. Family Tree DNA also provides significant tools for Y-line DNA as well as Mitochondrial DNA. 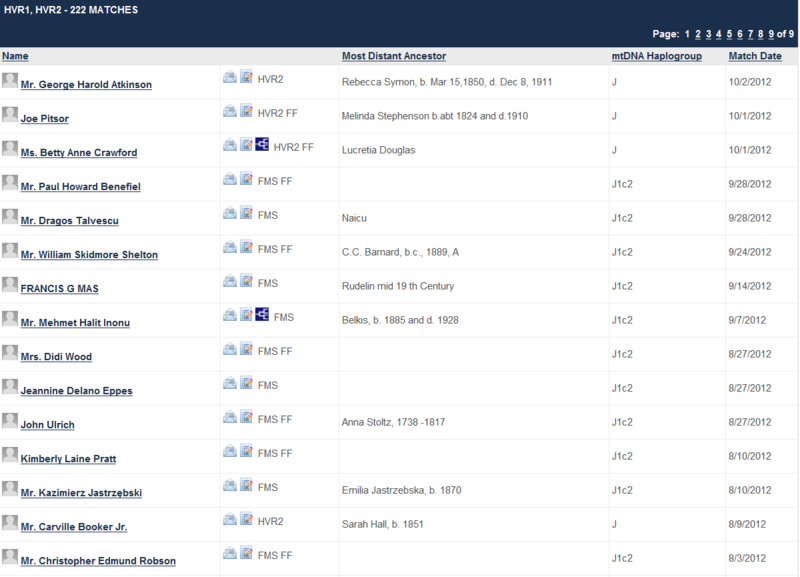 You can see both Family Tree and Ancestry Y-line results compared on this blog, which shows you how to use both companies’ tools. At Family Tree DNA, for all their tests, you are provided with the e-mail addresses of your matches. At Ancestry and 23andMe, you contact matches through their internal message system. My experience has been that direct e-mails have a better response rate. The person looking for Native Heritage will be most interested in their haplogroup designation. If your haplogroup is either Q or C, you’ll want to join your haplogroup project, minimally, as well as other relevant Native American projects, and work with the administrators for further testing. Remember, neither haplogroup Q nor C are always Native, so deeper testing may be in order. You may also match others with confirmed Native heritage, including a tribe. If the haplogroup is not Native, then you’ll have to take a look at possible reasons why. One can never interpret non-Native haplogroup results of any one line to answer the much broader questions of, “do I have Native heritage”, “how much” and “where?” What you can do at that point is to continue to test other lines in order to discover the identity of your Native American ancestor. Obviously, the Y-line test is only for males. Ladies, I feel your pain. However, these next tests are for both sexes. Mitochondrial DNA is inherited by all children from their mother only, with no admixture from the father. Women obtain their mitochondrial DNA from their mother, who got it from their mother, on up the line into infinity. This is the red circle on the right hand side of the pedigree chart. Like Y-line DNA, mitochondrial DNA is passed intact from one generation to the next, except for an occasional mutation that allows us to identify family members and family lines. Unfortunately, it does not follow any surname. In fact the surname changes with every generation when women marry. This makes it more challenging to work with genealogically, but certainly not impossible. Because of the surname changes in every generation, there are no “surname” projects for mitochondrial DNA, per se, but there are other types of projects. For example, the Mothers of Acadia project is using mitochondrial DNA to reconstruct the Acadian families including those of Native American heritage. There are three levels of testing you can take for mitochondrial DNA at Family Tree DNA, which is where I recommend that you test. The mtDNA, the mtDNAPlus and the Full Sequence. The mtDNA test is a starter test that will provide you with a base haplogroup, but will leave people searching for Native ancestry needing a more complete test for full haplogroup identification confirming Native ancestry. I strongly recommend the full sequence test, but if the budget just won’t allow that, then the mtDNAPlus will do until you can afford to upgrade. Family Tree DNA is the only major lab that tests the full sequence region, plus, they have the largest matching data base in the industry. To put this in perspective for you, the mtDNA and the mtDNAPlus tests both test about 10% of your mitochondrial DNA and the full sequence test tests all of your 16,569 mitochondrial locations. You can then compare them with other people who have taken any of those 3 tests. Pricing for the mtDNAPlus is currently $139 and the full sequence is $199. MtDNA testing is not as popular as Y-line testing because it’s more difficult to use genealogically as last names change every generation. When you look at your matches, you have no idea whatsoever if you might be related to these people in a genealogically relevant time frame by looking at their last names. Those who have invested the effort to collaboratively work on their mtDNA matches, assuming a full sequence match and a shared geographical history as well, have been pleasantly surprised by what they’ve found. A haplogroup assigning deep ancestry is provided through mitochondrial testing, so like the Y-line, depending on the haplogroup assigned, you will know if your ancestors were here before European contact. Maternal haplogroups that indicate Native heritage include A, B, C, D and X. Like Y-line DNA testing, none of these haplogroups are exclusive to Native Americans, so a full sequence level test will be required to confirm a Native American subgroup. After you receive your results, you can enter the mtDNA and mtDNAPlus portions into public data bases. There are no public data bases for the full sequence segment because there may be medical implications in some of those mutations, so they are not displayed publicly although they are compared privately within the Family Tree DNA data base. You will want to enter your data and check for matches at www.mitosearch.org (upload directly from your matches page at Family Tree DNA), www.smgf.org and www.ancestry.com, although beware of Ancestry’s accuracy issues. Testing the Y-line and mitochondrial DNA individually gives us a great deal of very specific information about 2 lines in your pedigree chart. The best method of identifying Native American ancestors is indeed to test as many lines on your DNA pedigree chart using this methodology as possible. Let’s take a minute to look at how to create a DNA pedigree chart. If your Y-line and mitochondrial DNA have proven not to be Native, that doesn’t mean that the rest of your lines aren’t. Let’s take a look at how to create a DNA pedigree chart so that you can focus your Y-line and mitochondrial DNA testing for other lines. The purpose of a DNA pedigree chart is to provide guidance in terms of inheritance and also to provide a way of documenting your progress. My chart is shown below, as an example. You can see the Y-line of my father and the mitochondrial line of my mother, on both ends of the pedigree chart. At the top of each line, I have recorded the haplogroup information for each family. Color coding each line helps in tracking descendants who would carry the DNA of the ancestor of that line. For example, my mother’s father’s mother’s line is the yellow Miller line. I need to find a daughter of my grandfather’s sisters, or their children, or their daughter’s children, to test for that mitochondrial DNA line. Which reminds me, I need to call my cousin. Family reunions, picnics and holidays are great for this type of thing. Sadly, so are funerals. I blogged about how to put together your own DNA pedigree chart. You can get a free copy and instructions on my website too, at www.dnaexplain.com under the Publications tab. If you’re Native and adopted, then refer to the adoptee blog instead, or in addition. But sometimes, we can’t find the right people in order to test, so we move to autosomal testing to help us fill in the blanks. Autosomal DNA testing tests all of your 23 pairs of chromosomes that you inherit from both of your parents. You get half of each chromosome from each parent. You can see this pattern on the pedigree chart, represented by all of the 16 genealogical lines. Therefore, as you move up that tree, you should have inherited about 25% of your DNA from each grandparent, about 12.5% of your DNA from each great-grandparent, as have all of their other great-grandchildren. Therefore beginning with your parents, you carry the following approximate amount of DNA from each of these ancestors. I say approximate, because while you do receive exactly 50% of your DNA from each parent, there is no guarantee that their parents DNA was admixed in your parents such that you receive exactly 25% from each grandparent, but it’s close. You can see the percentages in the chart below. Given this chart, if the Native percentage is back beyond 6 generations and drops below the 1% threshold, it’s extremely difficult to discern today. Autosomal testing will pick up relationships reliably back to about the 6th or 7th generations, and sporadically beyond that. Autosomal testing provides you minimally with two things. First, with a list of “cousin matches” by percentage and estimated relationship. Second, percentages of ethnicity. It’s this second part that’s most important for the person seeking to prove Native American heritage. As the field of genetic genealogy has moved forward, research has begun to indicate that certain autosomal markers are found in higher or lower frequencies in different ethnic populations. For example, if someone has the Duffy Null allele, or genetic marker, we know they positively have African admixture. We don’t know how much African admixture, or from which line, or when that individual with African admixture entered their family tree, but we know for sure they existed. Attempting to determine the population frequency of varying markers and what that means relative to other populations is the key to this analysis. Few markers are simply present or absent in populations, but are found in varying frequencies. Some populations are widely studied in the research literature, and others are virtually untouched. Thousands have only been recently discovered as part of the National Geographic, Genographic project. The process of compiling this information in a meaningful manner so that it can be analyzed is a formidable task, as the information is often found in nearly inaccessible academic and forensic research publications. It’s difficult to determine sometimes if the DNA analysis of 29 individuals in a small village in northern Italy is, for example, representative of that village as a whole, of northern Italy, or more broadly for all of Italy. Is it representative of Italy today or Italy historically? These and other similar questions have to be answered fully before the data from autosomal testing can be useful and reliable. Having said this, the recent release of the National Geographic, Genographic Project version 2.0 holds great promise. It’s one of 4 autosomal tests on the market today that provide next-generation chip based wide spectrum testing which replaces the older CODIS type testing. The difference between the old and new technology is using 15 or 20 markers versus a half a million or so. They aren’t even in the same ballpark. If you want to see a comparison of the older type tests, read my paper titled Revealing American Indian and Minority Heritage Using Y-Line, Mitochondrial, Autosomal and X Chromosome Testing Data Combined with Pedigree Analysis. Let’s take a look at all 4 of the contemporary autosomal tests and what they have to offer. Of the 4 tests, the Geno 2.0 is the newest and appears to reach back the deepest in time, meaning it may well be picking up anthropological results, not just genealogical results. We don’t know exactly how the analysis is done, but we do know, in general, that if you evaluate segments, you will get results closer in time than if you evaluate individual ancestry informative markers (AIMS). You can take a look at the results of a man with Native ancestry on both his paternal and maternal sides. You can also take a look at the reference populations used by National Geographic in this overview of their test results. If you want to order this test visit www.genographic.com. The price is $199. You also receive your Y-line and mtDNA haplogroups, but no marker values for comparison to others. However, the Y haplogroup testing is the most advanced in the world. You can see why in the Geno 2.0 announcement here. I have found the Geno 2.0 test to be somewhat more sensitive autosomally than others, but it’s still very new and I have not yet been able to do a complete comparison. Results have only been coming back for a couple of weeks. Family Tree DNA sells the Family Finder test. Right now it is priced at $199 or bundled with attractive pricing with either the Y-line or mitochondrial DNA tests. I often like to use this tool in conjunction with the Y-line and mitochondrial DNA tests to see, if you match someone closely, whether you are actually related to them in a recent timeframe or if it is further back. Family Tree DNA is the only one of the autosomal testing companies that has the ability to do this type of advanced comparison. Compared to 23andMe and Geno 2.0, they are the only ones to offer traditional Y-line and mitochondrial DNA testing which provides individual marker results and matches. In addition to a list of autosomal matches, you will receive your breakdown of ethnicity, by percent. The results below are for the same man with Native ancestry whose Geno 2.0 results are shown in the Geno 2.0 – First Peek blog. You can read more about the Family Tree DNA autosomal product on their FAQ. Another company that sells autosomal testing is www.23andme.com. In addition to a list of cousins, you also receive admixture percentages, and their specialty, health traits. You also receive a paternal and maternal haplogroup, but with no markers for personal comparison. These Y-line and mitochondrial results are not as accurate at the Geno 2.0 nor the Family Tree DNA Y-line and mitochondrial DNA full sequence tests. Be aware that while people who test at Family Tree DNA are interested in genealogy, the typical person at 23andMe tested for the health portion, not the genealogy portion, and may not answer contact requests or may know very little about their family history. Right now, their test is $99, and you can download your results and upload them to Family Tree DNA for an additional $89, making the total price similar to the Family Tree DNA test. However, you need to be somewhat technically savvy to complete the download/upload process. 23andMe recently released a new version of their software which added quite a bit of resolution after years of being woefully behind. Native American wasn’t even a category previously. You can take a look at the new format here. Ancestry.com recently introduced an autosomal test. You receive matches and ethnicity percentages. However, their ethnicity percentages have significant issues and I would not recommend them at this time. Their cousin matches come with no analysis tools. So for now, just skip Ancestry and concentrate on the other resources. One marker value in particular, known as D9S919 is present in about 30% of the Native people. The value of 9 at this marker is not known to be present in any other ethnic group, so this mutation occurred after the Native people migrated across Beringia into the Americas, but long enough ago to be present in many descendants. You can test this marker individually at Family Tree DNA, which is the only lab that offers this test. If you have the value of 9 at this marker, it confirms Native heritage, but if you don’t carry 9, it does NOT disprove Native heritage. After all, many Native people don’t carry it. To order this test, for existing Family Tree DNA clients, click on the “Order Upgrade” orange button on the right hand side of your personal page, then on “Advanced Test”, then enter “autosomal” in the drop down box, then you will see the list below. D9S919 is the last one and it costs $15. There may be a $10 one time transfer fee as well if your DNA sample is not in the Houston lab. As you can see there are lots of tools available to you that can be used individually or in conjunction with each other. Like anything else, the more work and effort you are willing to devote to the search, the more likely you are to be successful. Most people test their Y-line and mitochondrial DNA, not just for Native ancestry, but to learn more about the lines they can test for themselves without reaching out to other family members. Use your DNA pedigree chart to plan who to ask in your extended family to test for which lines. Plan to test with multiple autosomal testing companies. Autosomal testing in particular is still in its infancy. I like to use the results of multiple companies, especially when you are dealing with small amounts of admixture. They use different markers, combinations, analysis tools and reference populations, so you can expect slightly different results. One company may pick up slight minority admixture while another may not. This has happened repeatedly with both my Native and African minority admixture. After you obtain your results from either Family Tree DNA or 23andMe, you’ll want to download your raw data results and then upload the file to www.gedmatch.com. This is a privately run “donation” site, not associated with any of the testing companies, meaning there is no subscription or fee to use the tools, but they do appreciate and are funded by donations. After uploading your results you can utilize several admixture tools to compare and contrast your results. If you’re struggling with working through your family possibilities for who to test, I do offer a DNA Test Plan service. If you would like a Personalized DNA Report for Y-line or mitochondrial results, those are available as well. If you have what amounts to a quick question that I can answer in less than an hour, including prep, I offer the Quick Consult service. For more extensive consulting, contact me. You can see my services here. Finding our Native ancestors is a way to pay homage to their lives and to the culture that was stripped from their descendants, ironically, by using their own DNA that has been gifted from them to us. Native people, after contact with Europeans were marginalized, and that’s the best that can be said. Many were killed, either intentionally or by European diseases, or enslaved. The results are that Native people left few if any individual records and those that might be available often can’t be identified or linked to them personally. For those who cannot unearth their Native ancestry using conventional genealogical means, genetic testing is the last hope left. Fortunately, the tools and our knowledge improve every day. We’re making great strides with what we can do, enlarging what was a pinhole into a keyhole, allowing us to peer into the past. So, click your heels, order your tests and let’s see where your DNA takes you. First, all adoptees need to read my post on Adoptee Resources. I’m not an expert on how to deal with all of the bureaucratic and paperwork nightmares involved, which of course vary by state, but there are people who specialize in this and they have groups to help. Take advantage of them. Also, throughout the rest of this blog, be sure to click on the links. I’m not restating things that I’ve already covered elsewhere. Now, let’s look at the 3 kinds of DNA testing that can benefit adoptees and just how they might use the results. There are three kinds of DNA testing that you can do. Autosomal to test your ethnic mix and to find cousins related to you on any line. You can see the path that the Y chromosome takes down the paternal line to the brother and the path the mitochondrial DNA takes down the maternal line to both the brother and the sister. Autosomal tests the DNA of all of the 16 ancestral lines shown here, but in a different sort of way. The good news is that using comparison tools, we can determine a genetic surname in about one third of the cases. That’s pretty good odds for someone who started with no information at all. Looking at the Estes surname project as an example, you can see in this colorized version that there are mutations shown, in color, even within family groups. You can test at 12, 25, 37, 67 or 111 marker “locations” on the Y chromosome. In order to look for strong results you’re going to need to test at a minimum of 37 markers, preferably 67 or 111. At www.familytreedna.com, which is where I recommend that you test, you can always upgrade later, but it’s less expensive in total to test more initially, plus you may well need the information to know who you match at the highest levels. Right now, 37 markers cost $119 and 67 markers are $199, but a sale is currently underway. You can also join the adoptee project to obtain the best pricing by joining a project. After your results are returned, you can then upload or manually enter your results at www.ysearch.org (upload directly from your Family Tree DNA matches page), www.smgf.org and www.ancestry.com. You can then check for matches at these sites as well. Not all of these other sites test as many markers as Family Tree DNA, but the comparison is free and useful. Family Tree DNA also provides significant tools for Y-line DNA as well as Mitochondrial DNA as well. You can see both Family Tree and Ancestry results compared on this blog, which shows you how to use both companies’ tools. At Family Tree DNA, for all their tests, you are provided with the e-mail addresses of your matches. At Ancestry and 23andMe, you contact matches through thier internal message system. My experience has been that direct e-mails have a better response rate. You can also order a DNA Report from my company, DNAeXplain, or directly from your personal page at Family Tree DNA, if you need assistance understanding either Y-line or mitochondrial DNA results and wringing every possible tidbit from the available tools. Unfortunately, it does not follow any surname. In fact the surname changes with every generation when women marry. This makes it more challenging to work with genealogically, but certainly not impossible. Because of the surname changes in every generation, there are no “surname” projects for mitochondrial DNA, but the Mothers of Acadia project is using mitochondrial DNA to reconstruct the Acadian families. There are three levels of testing you can take for mitochondrial DNA at Family Tree DNA, which is where I recommend that you test. The mtDNA, the mtDNAPlus and the Full Sequence. The mtDNA test is a starter test that will only leave adoptees needing more. I strongly recommend the full sequence test, but if the budget just won’t allow that, then the mtDNAPlus will do until you can afford to upgrade. Family Tree DNA is the only major lab that tests the full sequence region, plus, they have the largest matching data base in the industry. To put this in perspective for you, the mtDNA and the mtDNAPlus tests both test about 10% of your mitochondrial DNA and the full sequence test tests all of your 16,569 mitochondrial locations. You can then compare them with other people who have taken any of those 3 tests. For adoptees, you’ll need the power of the full sequence test. Pricing for the mtDNAPlus is currently $139 and the full sequence is $199. If there was a DNA test created for adoptees, this is it. This test can be used alone or in conjunction with the Y-line or mitochondrial DNA testing at Family Tree DNA. They are the only lab to have this advanced matching capability. So, if you were to take an autosomal test, and another one of your grandparents grandchildren tested, you would match them at some predictable percentage of your DNA. You can see the “cheat-sheet” we use below, courtesy of the ISOGG wiki. You can see that your grandparents other grandchildren are your first cousins, and you share approximately 12.5% of your autosomal DNA with them. Therefore, if you match someone at 12.5%, you are either first cousins, great-grandchildren/great-grandparents or another relative with 12.5 in their “box” below, as compared to you. For an adoptee, this is the literal Holy Grail. You can match someone at the 25% level, or even the 50% level. Yes, siblings have found each other this way, although not to misset your expectations, it’s rare. Much more common are matches at smaller percentages, but even so, if you match someone who is cooperative, it’s not too difficult to work with their pedigree chart to get some idea who your parents might be. And even if you can’t figure that out, you know you are biologically related to them, something most adoptees have never experienced before aside from their own children. The adoptee group and others are working on tools and standard procedures for adoptees, as there are ways to work with this information. I have also blogged about the basics of what autosomal DNA gives you, and how to use it. There are three testing companies that sell autosomal DNA testing. I strongly suggest that you use all three of them, plus download your results to www.gedmatch.com and learn to use those tools, or work with someone on your behalf. Family Tree DNA sells the Family Finder test. Right now it is priced at $199 or bundled with attractive pricing with either the Y-line or mitochondrial DNA tests. For adoptees, I often like to use this tool in conjunction with the Y-line and mitochondrial DNA tests to see, if you match someone closely, whether you are actually related to them in a recent timeframe or if it is further back. Autosomal testing will pick up relationships reliably back to about the 6th or 7th generations, and sporadically beyond that. In addition to a list of matches, you will receive your breakdown of ethnicity, by percent. The admixture portions are improving, but just use them as a guideline, especially for percentages below 10%, and that goes for all three companies, in general. Another company that sells autosomal testing is www.23andme.com. In addition to a list of cousins, you also receive admixture percentages, and their specialty, health traits. For adoptees, this may be particularly important as well. Be aware that while people who test at Family Tree DNA are interested in genealogy, the typical person at 23andMe tested for the health portion, not the genealogy portion, and may not answer contact requests or may know very little about their family history. However, that doesn’t negate the possibility that you may find a very close match and you’ll never know if you don’t test. Right now, their test is $99, and you can download your results and upload them to Family Tree DNA for an additional $89, making the total price similar to the Family Tree DNA test. However, you need to be somewhat technically savvy to complete the download/upload process. The third company is www.ancestry.com. Compared to either Family Tree DNA or 23andMe, their tools are sorely lacking, but they too offer a list of matches and ethnicity. I suggest that you simply ignore their ethnicity calculations at this point in time as they are quite misleading. The good news about Ancestry subscribers, which is who you’ll be matching, is that they too are quite interested in genealogy. Unfortunately, you don’t have the data tools you’ll need to see how you match. Again, that does not negate the importance of a close match, so I recommend fishing in this pool even though it certainly doesn’t stand up to either of the other two companies. Their price fluctuates but is floating someplace around $129. Also be aware to access the full feature set of matches including trees, you will need to subscribe to Ancestry as well in some capacity, so the test price is not the only cost involved. Be sure to read their fine print first. After you obtain your results from either Family Tree DNA or 23andMe, you’ll want to download your raw data results and then upload the file to www.gedmatch.com. This is “donation” site, meaning there is no subscription or fee to use the tools, but they do appreciate donations. Ancestry does not provide your raw data, but has stated that they will sometime in 2013. While this suite of tools does not replace that missing information locked away in a file someplace, or worse, it does provide adoptees with hope where none may have existed before. Various kinds of DNA testing can provide answers, and relatives, both close and distant. You can also work with these tools with other adoptees and those who specialize in genetic genealogy to unlock those doors. Remember, the longest journey begins with a single step. Bon Voyage! I recently received this query. It made me smile. I receive a lot of e-mails similar to this. “I always thought I was an intelligent woman but I am absolutely stymied on how to proceed with the DNA results from Family Tree DNA. These are all good questions. Unfortunately, mitochondrial DNA is more difficult to use genealogically because of the name changes in every generation. What we really need is a big centralized data base someplace where we an enter our mitochondrial line names to see if anyone in that line has tested, but that data base doesn’t exist. That data base would provide the same type of function for mitochondrial DNA that surname projects do for paternal lines. If you want to know if your Johnson Y-line has tested, you just go and look in the Johnson project. You can’t do that with mitochondrial DNA, so it’s everyone for themselves. This means we need to be sure we do everything we can to help ourselves which gives us the best odds for success. My Dad used to say that luck was 99% elbow grease! What this lady didn’t say was whether or not she had tested to the full sequence level or just to the HVR1+HVR2 level. From what she did say, I’m betting that she is haplogroup H, the most common haplogroup in Europe, carried by about 50% of the people, and that she did not get her full sequence tested. If you are haplogroup H, and you have any HVR2 matches at all, the only reasonable way to sort out who is related in a genealogical timeframe is to take the full sequence test. Otherwise, trying to work with 65 pages of matches is kind of like swatting at flies. However, not everyone is reasonable, and maybe few of the people you match have taken the full sequence test. Even if you have taken the full sequence test, there is nothing you can do about those who haven’t and you’d like to be able to use the results you have to see if anyone is a genealogical match to you. In my case, I have 222 HVR1+HVR2 matches, but no full sequence matches. Many of my HVR1+HVR2 matches have taken the full sequence test, and I know they are NOT matches to me at the full sequence level, so I don’t need to send them the e-mail. They’ve been eliminated. At Family Tree DNA, you and I show as mitochondrial DNA matches at the HVR1+HVR2 level. This means that someplace back in time, we shared a common ancestor. I have tested at the full sequence level as well, so if you were to upgrade we could confirm that we continue to match, and in a genealogically relevant timeframe, or we would know that we don’t, and we can discontinue our search because our common ancestor was hundreds to thousands of years ago. I’m hopeful that perhaps we can identify our common ancestor, or perhaps just a common location. Goppmannsbuhl is a small village outside Speichersdorf, close to Bayreuth and the Czech border, not too far from Nuremburg in Germany. You can see the location on the Google map below. Do any of these families or locations look familiar to you? Sometimes even if we can’t find a common ancestor, we discover that our ancestors were from the same general area. Where does your mitochondrial DNA line come from? You’ll note that I did three things here. I mentioned major landmarks nearby that might be familiar to people, including the Czech border. At least one of my matches is from Czech Republic and if I don’t mention how close my ancestors lived to that border, people from there will see Germany and dismiss any possible match. I also included a map that people can click on. Sometimes that helps. Lastly, I clearly show the mitochondrial path so that if they don’t understand how that works, they can use my example – me to mother to her mother, etc. You’d be amazed at how many people are unclear about this. Oh, and one last thing, I don’t include the information about my mother. She is deceased, but they just don’t need that. While we are waiting for replies, we can upload our information to Mitosearch and continue our search there. You can do that by clicking on the “upload to Mitosearch” link on the bottom of your Matches page at Family Tree DNA, or you can enter your results manually if you tested elsewhere. We can also upload our GEDCOM files to both locations. That makes it easier for potential matches to see if there is anything relevant. The great thing about Mitosearch is that you can click on the User ID to see information provided by your matches when they were uploading or entering their information. There are various search criteria. I always select the option to compare me only to those who have tested both the HVR1 and HVR2 regions, and only show me people who match in both. Unfortunately, in Y-search, Mitosearch’s companion data base, you can search by surname, but Mitosearch doesn’t contain that feature. Not only does YSearch give you matches, but it also provides you with a list of pedigree charts that the name appears in. For names like Smith, this probably isn’t terribly useful, but for Mehlheimer, one match would be a goldmine. I click through the User Ids of all my exact matches. An exact match is when both “differences” columns equal zero. There are two other alternatives as well to find matches, although neither is wonderful. One is the Sorenson data base, www.smgf.org. The problem with this data base is that you can’t contact any of the matches, so aside from the genealogy that they provided and is shown with their DNA information, you’re dead in the water. Recently, since being acquired by Ancestry, this data base has been experiencing a significant amount of down time when it is unavailable. The other alternative is Ancestry.com. You can enter your results there and compare to their data base. However, before you do, read this blog about what to expect and the problems with Ancestry mitochondrial matches. Ironically, they provide no genealogical information unless the participant has connected their tree. Furthermore, you must contact your matches there though Ancestry’s message system and very few people reply. If you want to know more about your mitochondrial DNA and the secrets it holds for you, you can purchase the Personalized DNA Report on your personal page at Family Tree DNA under the orange “Order an Upgrade” button or on my webpage at http://www.dnaxplain.com/shop/features.aspx. I write these reports regardless of whether you purchase through Family Tree DNA or my website, and it’s the same report in either case. Hopefully, by now, your matches that you sent e-mails to will be replying! Happy mito hunting.